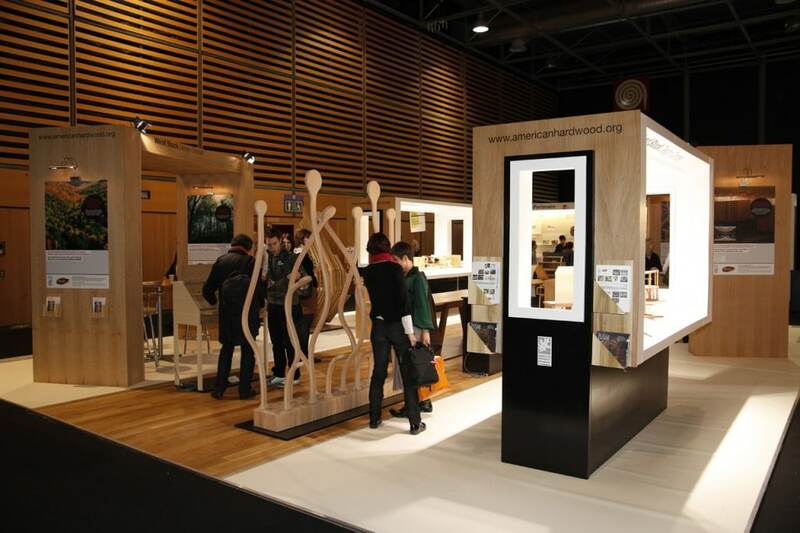 The American Hardwood Export Council (AHEC), SBID member, launched the first Wood Stock Design Competition at Maison & Objet in Paris. Thousands of visitors admired the 15 shortlisted entries which were manufactured into prototypes or scale models in American hardwood. The quality of the entries was exceptionally high and the jury members were extremely impressed by the talent of the young designers and architects from France and Belgium. AHEC launched the Wood Stock Design Competition to encourage young professionals and graduates to explore the use of American hardwoods in design. As natural and sustainable materials, hardwoods have many different physical and mechanical properties, so understanding wood as a material is crucial in order to use it to its maximum potential in design. In May 2011, the jury selected 15 projects to be manufactured into prototypes or scale models. Over the summer, the entrants worked with the selected manufacturer (La Fabrique) and model maker (Ray Winder), to develop their designs and the final work was exhibited at Maison & Objet last week. The jury was chaired by Christian Liaigre, interior designer and CEO of Maison Liaigre whose elegant designs have made his company one of the top French luxury brands at export level. He was joined by leading architect Philippe Chaix, designer Guillaume Delvigne, deputy chief editor of the architectural magazine AMC Catherine Pierre, and French organisations in the timber industry CNDB and FCBA. This first category, open only to student applicants, focussed on stand-alone product or furniture design. Students were given a brief of ‘urban design’ which could link to communication tools such as mobile phones and laptops, but this was just a starting point and not obligatory. The judges looked in particular for creativity and innovative design. The designs needed to be usable, both aesthetically and technically, and the students were expected to consider how easily the product could be manufactured, taking eco-design considerations into account. The judges were extremely impressed by the commercial feasibility of this piece. Potentially available in different sizes and colours, ‘Tandem’ reflects today’s way of working on the move with portable devices. ‘Tandem’ would work well for instance in a home environment, but also in public places such as an airport lounge. This lively piece also won the public vote with 35% of votes. The piece designed in American white oak shows off the grain and texture of the wood with its solid top and revolving table. The base of the seat and the rims on which the shelf revolves are made in aluminium to provide the required strength whist keeping the shelf lightweight and streamline. The judges also highly commended ‘Claustra’ designed by Manon Malatray. An innovative piece, this design combines a coat stand with a room divider. ‘Claustra’ takes advantage of red oak’s excellent steam bending properties allowing a sharp curve in many of the elements. The second category challenged students and graduates to design a functional interior structure which provides spatial organisation. The judges were looking for a creative approach to this open brief. The space must be comfortable and practical and should take advantage of the decorative quality of American hardwoods. The design should be adaptable for use in different environments. A reception desk designed for a school, this entry was a perfect fit with the brief to organise a space. Reminiscent of work by Charles Rennie Mackintosh, the judges prised the repetitive use of squares and cut outs creating shadows which indicate to the school students whether the reception was open or closed. The contrast of wood species chosen creates interesting patterns with the light American tulipwood against dark American walnut. The judges were also very impressed by ‘Hearth’, a project designed by Belgian students Pieter Vanderhenst and Mathias De Ferm. One of the modules of Hearth was manufactured by the students and displayed at the exhibition. American white oak was specified so the piece would be suitable for exterior use. The judges were attracted to the Moroccan inspired design and liked the piece as an individual module as well as the shapes that the modules can collectively create. The third category tested the applicants’ architectural skills by asking them to design an extension or renovation to an existing building. Judges looked in particular for creativity, and for the relevance of the design to the existing building and its surroundings. Technically, the choice of species was crucial for the design’s practicality and entrants were asked to provide detailed drawings to demonstrate the long-term workability of the design. The innovative wooden cube structure is moveable creating an intimate and warm environment in the winter months, but can slide back to allow sunlight into the conservatory area in the summer months. The cladding in American ash is contrasted by the darker foldable seats in American gum. The judges were impressed by simplicity and workability of this very original design. AHEC’s affiliation with design and architectural schools across Europe is stronger than ever. Students are the key decision makers in future design and architecture and AHEC is working to ensure the hardwood message is included in school curriculums. AHEC is currently investing in an extensive LCA (Life Cycle Analysis) Study for the U.S. hardwood industry, which puts science at the heart of the green building debate. With a growing trend towards ‘green’ design, it is essential that architects and designers are provided with peer reviewed data to allow them to make fair comparisons when specifying materials. AHEC will continue to invest in educative projects and competitions with students across Europe in wp-content/2012.